This movie was only half-lying based on its title. Unlike some previous outings (we all remember when Maciste showed up instead of Goliath in Goliath and the Vampires) there was actually a guy named Goliath tearing up ships and heaving Styrofoam rocks at guys in linen dresses. However, it pains me to report that the movie was quite bereft of anything that could be called a giant other than a guy Goliath fought who just happened to be taller than him. The film did do a good job of keeping me interested in giants though since the bad guy (Volkan) made a few cryptic mentions of his giants and how that would keep this Goliath fellow out of his hair, but even when Goliath took on these cavemen, who I can only guess were the giants, there were about four of five of them and they mostly got chucked off a cliff. That’s another thing about this movie. It really isn’t very good or even that funny, but if your thing is people getting thrown off cliffs, you’ll get your money’s worth! Goliath gets us in on his sweaty all-male action right from kickoff when we see his army routing someone or other. It has been five long years of war and Goliath is finally triumphant. We weren’t ever really told much about who the battle was against or why it was being fought or how someone as invincible and with such big, shiny pecs as Goliath took five years to make the other side smell his leather jock and cry uncle, but none of that matters because no sooner does he beat down his enemies from without than he is informed that there is now an enemy from within he will have to vanquish. Back home named Volkan who has killed the good king, assumed the throne, raised taxes, and starting pushing little old ladies off cliffs. In other words, a just your typical big government liberal. Goliath orders his army back home over land, while he and few guys take a shortcut across the sea. It was in an effort to stop a messenger from telling Volkan they were coming, but that plan goes out the window as soon a giant iguana starts trying to board his ship! Moving on to the expected shipwreck, Goliath, Elea (a blonde chick he rescued earlier), and two of his buddies are the only survivors and get menaced by a pack of Amazons! As far as Amazons go, these gals are pretty lame, especially with their striped tights they wear. Those would not be flattering on anyone! They kill one of Goliath’s buddies and Goliath handles these Amazons by basically running away from them. Back at Goliath’s hometown, there’s lots of action happening. Elea gets herself sentenced to death and is added to the big pay-per-view at the Colosseum. One of Goliath’s pals, Rhesus, gets himself imprisoned and there’s some kind of spiked torture wheel that he gets threatened with. Goliath puts on a blue tunic and goes undercover at the gladiator fights in an effort to rescue Elea. He gets Elea set free, has some battles, throws a stone door on some people and then ends up in a lion fight! There are some scenes where it looks like he ended up in a fight with a guy in a lion suit, but they do a lot of quick cuts and there was one scene in the battle when someone dressed up like Goliath was climbing on the lion’s back, so all in all it was pretty fair as lion fights go. Did I mention that he also found time to stab a guy in a gorilla suit who was in the area as well? I didn’t know what to make of that, but I was still waiting on some giants, so I waved it off as not being very impressive. 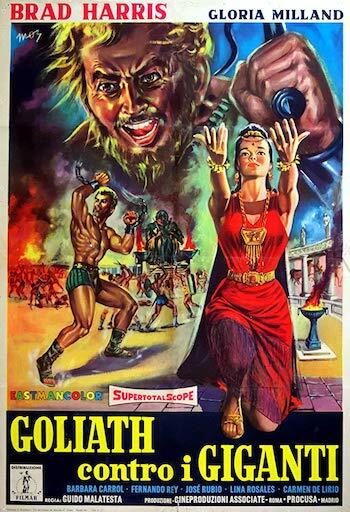 Eventually, Goliath wraps everything up by beating down some hairy cavemen. The monsters are lame and are rarely on screen or present that much of a threat while the story is hampered by its generic plot coupled with its lazy introduction and exit of various elements (a stowaway, the Amazons, the ape man). More problematic is that Brad Harris is an unimpressive Goliath, his questionable hair and beard (Orange? Really?) taking away from his manly chest and guns. He does have a great reaction shot when he sees the lions for the first time. Someone check that boy’s leather jock to see if he needs changing!